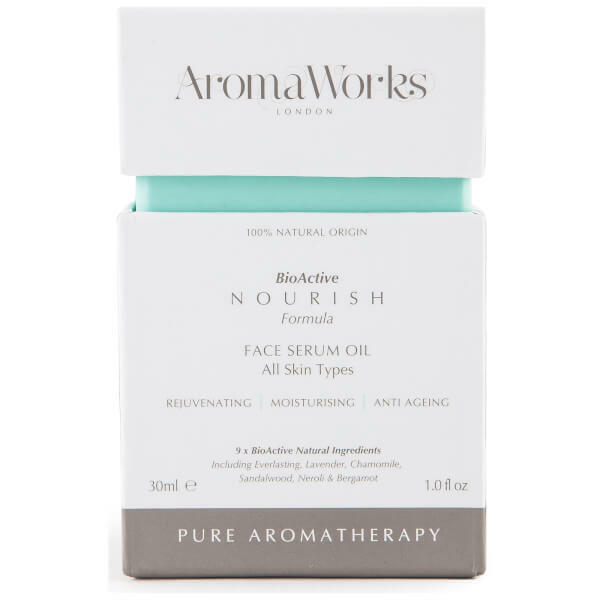 Achieve a healthy-looking radiance with the AromaWorks Nourish Face Serum Oil. Expertly formulated with 9 natural BioActive ingredients brimming with essential nutrients and vitamins, the serum works to repair and restore skin whilst combating premature signs of ageing. Enriched with extracts of Bamboo and Seagrass, the treatment works as a gentle exfoliant, lifting away dirt, dead cells and impurities to smooth and polish skin texture. The addition of Neroli and Sandalwood encourages cell renewal, helping minimise the appearance of fine lines and wrinkles. Skin is left looking brighter and revitalised. Apply a small amount to the face and neck before using face cream. Aqua, Glycerin, Citrullus Vulgaris (Watermelon) Fruit Extract, Pyridoxine Cylic Phosphate, Sodium, Pca, Anastatica Hierochuntica Extract, Sodium Hyaluronate, Glasminoglycans, Davidsonia Pruriens Extract, Leuconostoc/Radish Root Ferment Filtrate, Arnica Montanta Flower Extract, Calendula Officinalis Flower Extract, Chondrus Crispus Powder, Acanthopanax Senticosus (Eluthero) Root Extract, Eqisetum Arvense Extract, Pentapeptide-34 Trifluoroacetate, Xanthan Gum, Potassium Sorbate, Rosa Centifolia Flower Oil, Bosweillia Carteri (Frankincense) Oil, Daucus Carota Sativa (Carrott) Seed Oil, Jasminum Officinale (Jasmine) Oil, Citrus Aurantium (Neroli) Oil, Bergamot (Citrus Bergamia) Fruit Oil, Angustisfolium Flower Oil, Limonene, Gernaniol, Citronellol, Linalool.